Donald Trump has spent the summer slandering Mexicans as rapists an d drug dealers, calling for mass expulsion of undocumented immigrants (including U.S. citizen children), and proposing to disembowel the 14th Amendment. Over the weekend he leveled an attack on DREAMers—undocumented immigrants brought to the U.S. as young children—and on Monday he released a venomous Willie Horton-style race-baiting video attacking Jeb Bush for saying that undocumented immigration can be “an act of love” by using mugshots of undocumented immigrants linked to high-profile murders. 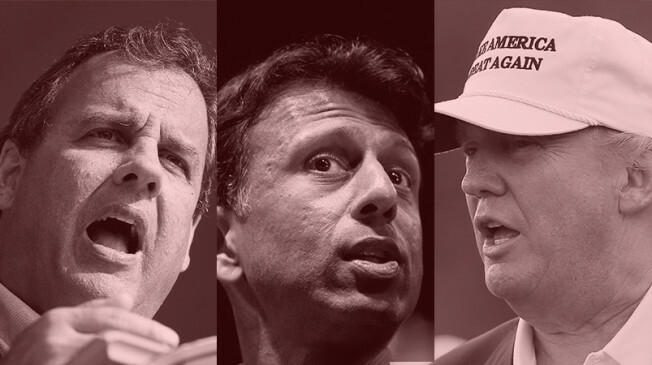 But rather than call out Trump for his xenophobic, nativist and racist demagoguery, the other GOP White House contenders have instead settled into a shameful pattern of trying to out-Trump Trump. Instead of developing serious immigration policy solutions—something the vast majority of Americans favor—Trump’s Republican presidential rivals have lurched to the extreme right offering absurd and irresponsible ideas in an effort to outmaneuver the GOP frontrunner. The newest ridiculous proposal came over the weekend from Chris Christie speaking at a New Hampshire Town Hall event. Christie suggested tracking noncitizen visitors like courier packages. According to the New Jersey governor it’s all quite simple, “You go online and at any moment, FedEx can tell you where that package is…Yet we let people come into this country with visas, and the minute they come in, we lose track of them.” Christie didn’t elaborate with details, so it’s not clear whether he intends to put barcodes on tourists’ backs, chips in the necks of business visitors or GPS trackers on the foreheads green card holders. I guess we’ll have to wait for his written policy proposal. Beyond being a really dumb idea, Christie’s FedEx immigrant tracking system shows that the former federal prosecutor is also profoundly ignorant of U.S. law and policy. The Department of Homeland Security already collects biometric data—including digital images and fingerprints—from nearly every noncitizen entering the U.S. at air and sea ports. The tracking is even more intensive for other visitors including students and exchange visitors. The Student and Exchange Visitor Information System, for example, tracks and monitors foreign students after they arrive and throughout their studies in the U.S. Those who fail to show up for school are routinely arrested and detained by ICE agents who are alerted by the tracking system. The bottom line is that while it remains a work in progress, our visitor tracking has already advanced significantly since 9/11. Christie’s plan goes beyond common sense and treats people like inanimate objects. The other problem for Christie is that tracking a person’s every move probably violates the Constitution. Earlier this year, in Torrey Dale Grady vs. North Carolina, the Supreme Court made clear that if the government puts a GPS tracker on someone—whether they’re a citizen or not—it constitutes a search protected by the 4th Amendment. But don’t tell that to Donald Trump, Chris Christie or the other GOP presidential candidates. They’ve already proposed to eviscerate the 14th Amendment, the cornerstone of American civil rights that ensures due process and equal protection to all persons. The Republican politicians might be tempted to propose shredding the entire Constitution which, it seems, gets in the way of some of their most repugnant ideas. Not to be outdone by Christie’s FedEx immigrant tracking system, Wisconsin governor Scott Walker—who used to be a pro-immigrant conservative before he became an anti-immigrant nativist—has made the ludicrous claim that building a border wall between the U.S. and Canadais a “legitimate” idea. He also made the unsubstantiated assertion that “Islamic extremists” are flooding the U.S. Mexico border. Putting aside for the moment that for most of the year much of the 5,525 mile U.S. Canadian border is a frozen mass of snow and ice, there is little evidence that hordes of Canadians (or anyone else) are illegally sneaking over the border. But even if there was, why stop at building the wall at the northern border? If it’s true that about 40 percent of the undocumented immigrant population arrived in the U.S. legally on visas but overstayed, as Chris Christie claimed in New Hampshire over the weekend, then many of the undocumented immigrants probably arrived on airplanes. So why not build walls around our airports too? It might put a crimp in the take-off and landing part of U.S. and international aviation, but it’s sure to keep out illegal immigrants—along with business people, investors, entrepreneurs, artists, scientists and anyone else who adds to the fabric of our nation. It would be unfair to leave out Louisiana Governor Bobby Jindal, who was on ABC’s “This Week” on Sunday insisting that “immigrants come here legally, learn English, adopt our values, roll up our sleeves and get to work.” When asked what he meant by “adopt our values” Jindal pointed to the example of immigrants in Europe who do not integrate into the cultures of their adopted countries. Jindal—who is a U.S. citizen because of birthright citizenship but now opposes birthright citizenship—didn’t mention that unlike the U.S. many of those countries do not have birthright citizenship and, therefore, many immigrants to Europe are not able to fully integrate into the cultures of their adopted countries. Jindal also failed to point that American law already requires that immigrants learn to speak, read and write English to become citizens. Aspiring Americans are also tested on their knowledge of U.S. history and government. Maybe politicians like Jindal should also be required to take the citizenship test before they can run for president. The first question is “What is the supreme law of the land? The answer is “the Constitution.” The test might prove to be a more efficient way to narrow the field of presidential contenders. Nothing that’s been proposed by Trump or those who try and mimic him will do anything to build a safe, orderly and fair immigration system. Whether it’s building a wall, mass deportation, eviscerating birthright citizenship, attacking DREAMers or tracking people like packages, none of the anti-immigrant proposals put out by Trump or the other GOP candidates will solve the problem of 11 million undocumented people living in the U.S., working hard, paying taxes and raising children. Nor will anything Trump or his GOP rivals have proposed fix the broken visa system so that it meets the needs of American business, creates American jobs, and keeps America globally competitive. At some point Trump may have to answer for his hateful rhetoric and preposterous immigration policy proposals. But unless someone in the GOP finds the guts to forcefully stand up to his demagoguery rather than follow his lead, the Republican Party risks being branded the Party of Trump for years to come. David Leopold practices immigration law in Cleveland. He is past president of the American Immigration Lawyers Association. Kathryn Steinle’s tragic murder in San Francisco, allegedly by Francisco Lopez-Sanchez, a Mexican national who entered the country illegally, has understandably led to many questions. But Republican politicians—from Donald Trump to Rep. Steve King (Iowa)—are largely focusing on the wrong ones. 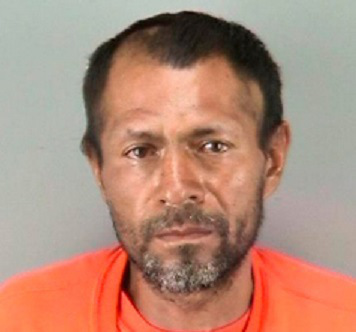 They are cynically seizing upon Kathryn Steinle’s murder to malign San Francisco’s so-called “Sanctuary City” policy, and all immigrants in the bargain. They are driving the narrative that Lopez-Sanchez fled to San Francisco because he wanted to avoid deportation. This is not only wrong on the facts—Lopez-Sanchez did not “flee” to San Francisco, he was brought there in handcuffs—but it fails to hold the federal Bureau of Prisons officials accountable for releasing him to the San Francisco Sheriff’s authorities, without determining whether the county prosecutor intended to follow through on the old drug warrant. And it fails to hold ICE responsible for not trying harder to deport Sanchez-Lopez the moment they had the opportunity. San Francisco was only the last place that Lopez-Sanchez ended up, yet all the focus has been on the City. The fact is, the Federal government had Sanchez-Lopez in their clutches, with all the tools they needed to deport him, but for some reason they did not. Of course, not everyone who has a prior deportation on his record should be an enforcement priority. I know many good, hard-working immigrants who have immigration violations from the past and still deserve a chance at the American Dream. But Lopez-Sanchez wasn’t here to build a life as an “immigrant.” He was a criminal with drug and mental health problems who was essentially living in our federal prisons on illegal reentry convictions. That should have been clear to anyone who reviewed his case, and the public has the right to know what went wrong here. Under existing Obama administration enforcement guidelines, Lopez-Sanchez should have been a top priority. Why wasn’t he treated as such? Why did the federal Bureau of Prisons release Sanchez-Lopez to the San Francisco Sheriff’s Department in March 2015, instead of sending him to ICE, which had reportedly requested him? Did the federal bureaucracy, including BOP and ICE, communicate with each other about Sanchez-Lopez? If not, why not? Following his 2011 conviction for illegal re-entry, Lopez-Sanchez was ordered to be sent to a “federal medical facility as soon as possible.” Was he? Did he receive mental health support? Why didn’t BOP or ICE take the time to consider whether the San Francisco County Prosecutor would actually follow through on the 20 year-old drug warrant before releasing him from Federal custody—knowing full well that it’s far easier to deport someone when they are in your grasp than when they are not? Why weren’t federal law enforcement authorities all over Sanchez-Lopez as his prison release date approached in March of this year? After all, he is the poster-villain for why American needs fair and smart enforcement of its immigration laws. Given Lopez-Sanchez’s twenty-year record of disrespecting the law, and 16 year and ½ month stint in Federal prison, you would think that deporting him as soon as possible would have been a priority. The immigration laws passed by Congress—which are designed to be harsh on felons like Lopez-Sanchez—gave ICE the authority to get rid of him as soon as his Federal prison sentence was complete. As a felon who illegally reentered the U.S. he was likely under a final order of removal. If standard removal order reinstatement procedure was followed after his arrest on the federal illegal reentry charge there was no need to go to an immigration judge for a deportation order. It was already in place, waiting to be implemented. And the deportation of Sanchez-Lopez would have been in line with the Department of Homeland Security’s stated enforcement policies, which prioritize the deportation of people who are convicted of multiple, serious felonies. Ironically, these are the very same deportation guidelines that Republicans in Congress have opposed. It’s no wonder they don’t want to draw attention to that fact and the truth about this case—because they actually, honestly oppose prioritizing enforcement on the worst of the worst. Instead, they want to send immigration agents out after anyone and everyone. Republicans’ policy of “full enforcement” treats everyone—immigrant workers and convicted felons—as a priority. If they had their way, the government would have less resources to go after bad guys because they’d be spending more resources going after ordinary folks–and you’d have more people like Lopez-Sanchez falling through the cracks. Everyone wants to live in a safe community—and yes, that includes immigrants. But some of the Republican ideas on the table today would make communities less secure. Our policies should be based on facts, not fear. There are still a lot of unanswered questions about Kathryn Steinle’s killer, but they point to a Federal breakdown and a Federal solution, not strong-arming state and local police. Having state and local law enforcement take on the work of federal immigration officials undermines community policing and is counterproductive. When state and local law enforcement are entangled in these functions, immigrant communities view them with increased suspicion. Republicans claim to be tough on criminals, but they oppose the Obama administration’s deportation priorities and oppose comprehensive immigration reform, which would have increased enforcement while dealing smartly with immigrants who are threats to no one. They want to force local police to become immigration agents and undermine their relationships with members of the immigrant community. If some good can come from Kathryn Steinle’s murder, it has to be based on a sober review of the actual facts. To date, Republican proposals are sensational, off-target, and seriously dangerous. We can and must do better than that. The states opposing the preliminary injunction–Washington, California, Connecticut, Delaware, Hawai’i, Illinois, Iowa, Maryland, Massachusetts, New Mexico, New York, Oregon, Rhode Island, and Vermont and of the District of Columbia–are granted leave to file amicus briefs in support of the Obama Administration’s appeal of the preliminary injunction. Note: The Court has set oral argument on the motion to stay the injunction. Oral argument on the appeal itself has not yet been scheduled. Presumably oral argument on the appeal will be set in the next few weeks. The Fifth Circuit website indicates that the names of the judges hearing oral argument will not be posted until at least a week before the beginning of the court week. Given the expedited briefing schedule, the 5th Circuit Court of Appeals could issue a decision on the Obama Administration’s appeal of Judge Hanen’s order sometime in June. This means that regardless of whether the Court of Appeals temporarily stays (lifts) the injunction, if the Obama Administration wins the case the delay to DAPA/DACA expansion could be no more than a few weeks.